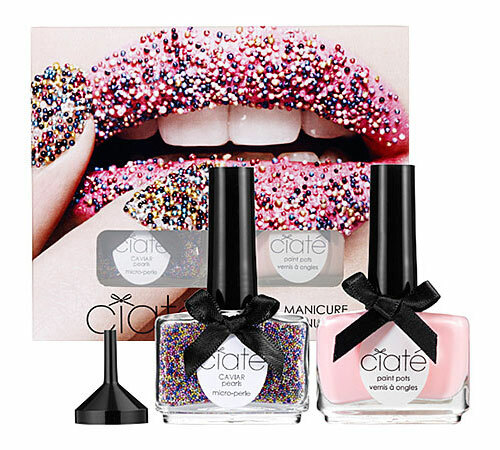 A Sweet Sprinkle-Effect Manicure, Courtesy of Ciaté! Ever since becoming quite the Pinterest enthusiast, I've developed an obsession with pinning all sorts of awesome nail designs. And while I'm mostly far too lazy (not to mention not nearly dextrous enough) to recreate all my creative findings on my own nails, I still can't help but to click through to cool tutorials to see how the Pinterest pros pull it off. That said, I've still always wondered how certain nail art prodigies manage to create that awesome "sprinkle" effect on their nails. Do they actually pour sprinkles on their nails after slathering them in a healthy coat of lacquer? Dip them in the spill-over after a particularly messy baking frenzy? Well, our friends at London-based Ciaté have the answer, and it's certainly much easier (and much more glamorous) than raiding your pantry! The just-released Caviar Manicure kits, available now at Sephora for $25 a pop, provide a 2-part process to achieve the editorial-worthy effect you see in the picture above (though I'd recommend sticking to just your nails - not your lips)! Available in rainbow, black, and white, this awesome nail art manicure lasts just 48 hours... but that's 2 days of envious glances, rad-looking nails, and of course, your own collection of uploaded Pinterest pins that will definitely get you a few dozen more followers... am I right?